Heard about Butcher Box, the meat delivery subscription service, and wondered if it’s worth it? 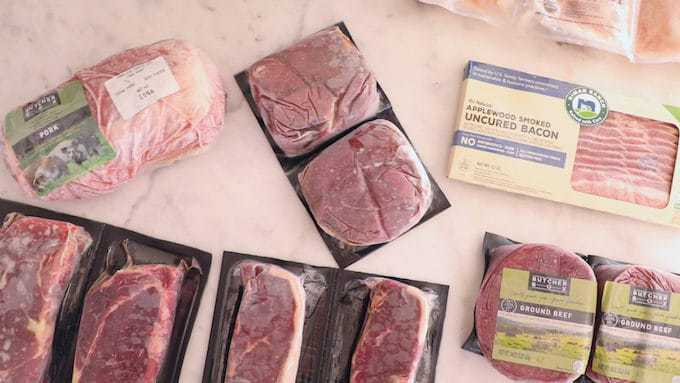 In this review and unboxing, we share the top three reasons that makes Butcher Box standout from the crowd. 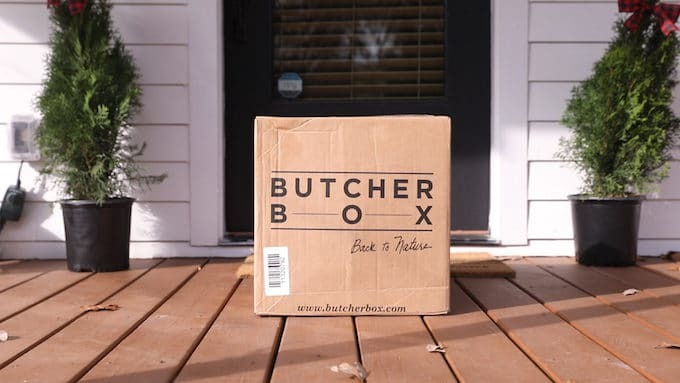 Read on to find out if Butcher Box is right for you, plus get special savings on your first order, exclusive to R+R readers! 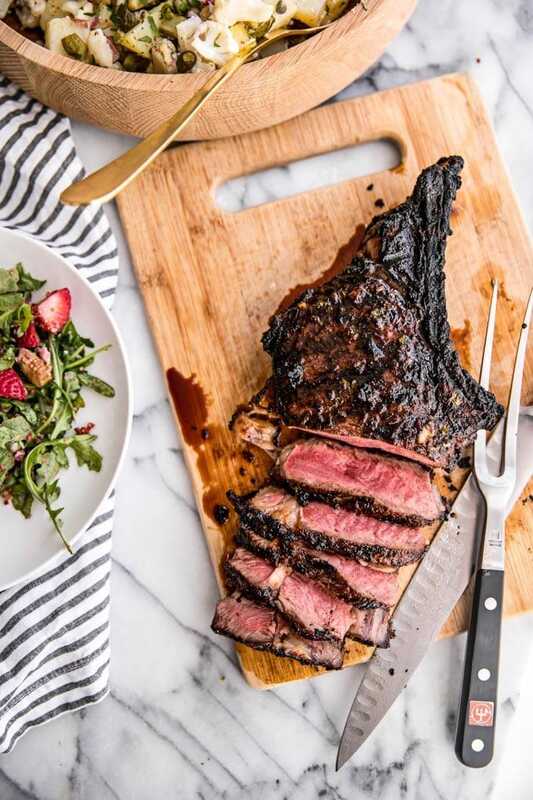 By now, many of you have heard about the popular monthly meat delivery service, Butcher Box, that delivers high quality hormone- and antibiotic-free cuts direct to your door, including 100% grass-fed and grass-finished beef, free range organic chicken and heritage breed pork. The question, of course, is: Is it worth it? 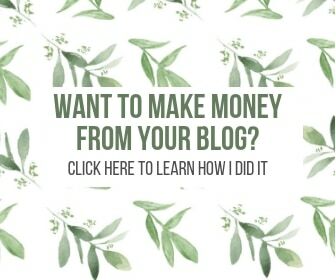 In my completely unbiased opinion (this is NOT a sponsored post), the answer is a definitive YES! 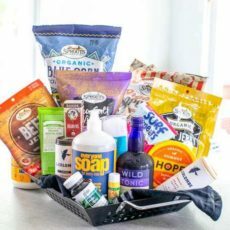 In this post, I’ve outlined the top 3 reasons why I love Butcher Box and look forward to receiving my box every month. Looking for an unboxing video so you can see what’s really in a Butcher Box and what you can expect when you order yours. Check out my unboxing demo below. Is Eating Meat Really Healthy? But first, one of the questions I get the most is whether or not animal protein/meat should be included in an anti-inflammatory diet. Carnivores will be happy to know my answer is also a resounding YES!! When it comes to eating meat, I’m very particular about only eating grass-fed, organic and ethically-raised animal protein. There are so many reasons to swap conventional, factory-farmed meat for grass-fed, humanely raised, antibiotic- and hormone-free animal protein: It’s more humane and better for the animal; it’s more sustainable and better for the environment; and it’s higher in nutrients and better for YOU! But finding high-quality, grass-fed meat isn’t always easy–which is where Butcher Box comes in! Is Butcher Box Worth it? Is Butcher Box worth it? The first and foremost reason I love Butcher Box is because of their meat quality. 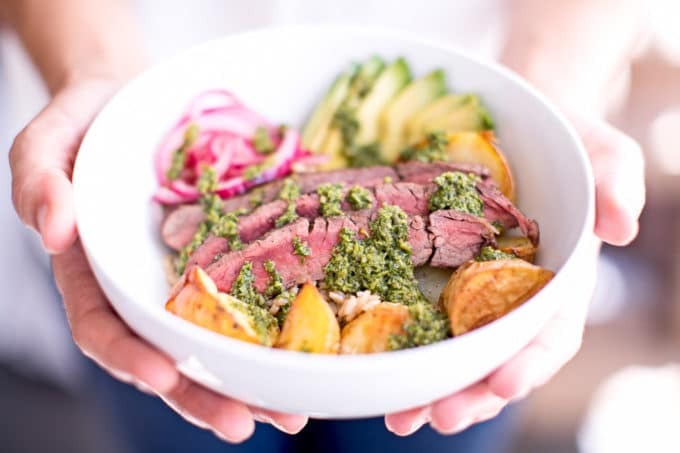 It’s so important to buy meat from a place you trust, and Butcher Box’s commitment to ethically-raised, top-quality meat is evident through their sourcing practices and – of course – the delicious taste! All the beef is 100% grass-fed and grass-finished and never given antibiotics or hormones. All the cattle are humanely raised and live their entire life on pasture, eating a natural diet of grass. The chicken is both organic and pasture-raised. It’s Certified Humane, meaning that the chickens have access to the outdoors and to shelter, are naturally fed, have plenty of room to move and do what chickens naturally do, interact with other chickens, and minimize stress at each stage of life. The pork is heritage breed (which is a rare find!) and free of antibiotics and hormones. The pork is either pastured, or meets the standards of being raised in open barns with space to engage in natural behaviors and given bedding. No tail docking or other physical alterations are allowed. The lamb is grass-fed and grass-finished, organic and free range, as well as being hormone- and antibiotic-free and certified humane. Unfortunately, 97% of the beef for sale in the USA is grain-fed and processed in feedlots. Why does this matter? There are countless studies showing the dramatic difference between grass- and grain-fed meat, and the enormous benefits of eating grass-fed for our health. If that’s not reason enough, it’s also a safer option as grass-fed meat has been shown to decrease your risk of food poisoning AND results in less antibiotic-resistant bacteria in our bodies compared to conventional meat. Finally, but no less important, grass-fed meat is better for the environment. Contrary to popular beliefs about meat production harming the environment, research now shows that traditional grass-based beef production and finishing actually benefits the environment by decreasing greenhouse gas emissions, increasing biodiversity of pasture ecosystems and improving quality of run-off water from well-managed pastures. CONCLUSION: If you’re committed to only eating the best quality meat, Butcher Box is a trustworthy source. If you’re doing your own research and want to buy meat elsewhere, be sure to look for grass-fed and grass-finished (which means the cattle remain on the pasture and are *never* fed grains, whereas only grass-fed means that they may be grain-finished). Also be sure your meats are hormone- and antibiotic-free, and ethically and humanely raised. The average cost for Butcher Box works out to less than $6/meal (based on a 4 to 6 oz. serving size), plus shipping is always free (to the continental 48 states). But how does that compare to other retailers? Let’s use an easy and widely available meat like ground beef for an example. c) you get the added convenience of not having to shop. Groceries arriving straight to my door is one of my favorite things, as it saves me so much time and lets me focus on work, take a yoga class or spend time with my hubby. COSTCO: Costco sells organic ground beef for $24.39 for a 4-pound package, which works out to $2.49/per 6 oz. serving. While yes, this is certainly cheaper than Butcher Box, the ground beef does not state that it’s grass-fed. It’s organic, hormone- and antibiotic-free, which is all awesome, but grass-fed is a KEY distinction that actually makes a huge difference (as we talked about in point #1). CONCLUSION: While organic is great, when it comes to meat, my opinion is that grass-fed and grass-finished is BETTER, as long as it’s also hormone- and antibiotic-free. The health benefits of grass-fed far outweigh that of grain-fed (and in fact, grain-fed and factory farmed meat can have adverse impact on our health). So to me, the extra money is well worth it! Another important point here: in this example, I used ground beef, a cut of meat that is typically more affordable. Because Butcher Box is one monthly price for a VARIETY of meat, so the direct price comparison will look different for more expensive cuts like high-quality lamb and pork. In other words, by virtue of paying a flat fee per box, you’re saving money on more expensive cuts of meat while possibly paying a little more for cheaper cuts of meat, so in the end I find that the price really averages out to be super affordable, comparable and convenient! Yep, I’ll go ahead and admit it – to me, convenience is king. As shared above, I love saving time on daily tasks where I can, because it allows me to focus on other things that add to my quality of life and help me relax. 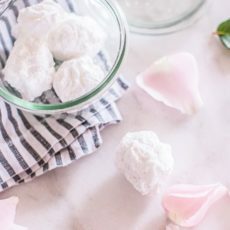 Given my history of hormonal imbalance, anxiety, digestive disorders and more, it’s really important that I find ways to simplify my life and focus on what I really love. When I don’t and start to get stressed, those old symptoms start creeping their way back in. So to me, paying a couple extra bucks for convenient services like Butcher Box, Amazon Prime, Thrive Market and other subscription services is a no-brainer. Another thing I appreciate about Butcher Box is that you can either customize your own box of up to 21 different cuts of meats, or choose the classic box that’s curated for you, where each month is a new and surprising collection. Of course, convenience only takes precedence when the quality is there, which is why that’s priority #1. Naturally, I would never sacrifice quality or my values for convenience, so doing your research and making informed decisions about the brands you choose and the companies you support is KEY! 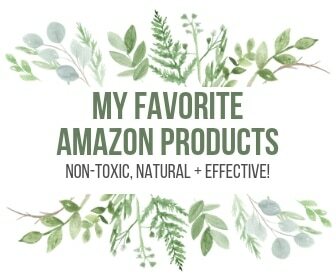 If you want to save yourself some time from researching the nitty-gritty of what brands are best for healthier food, beauty and home options, you’ll be glad to know I’ve already done the legwork for you on TONS of different products. 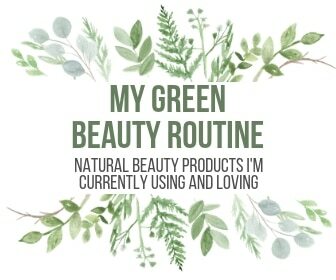 Here’s a link to our Savvy Swap series to help you out on how to upgrade your wellness by changing to healthier, non-toxic products! CONCLUSION: If you have trouble finding high quality, healthy meat near you–or if you want to save time and skip the hassle of shopping, having the convenience of knowing that each month you’ll have a new assortment of carefully selected meat automatically delivered to your front door (and all in one eco-friendly box! )–then ButcherBox is for you. Hopefully by now, I’ve convinced you to give Butcher Box a try. If I can entice you one more time, it’s with this awesome promo code, exclusive to R+R readers. 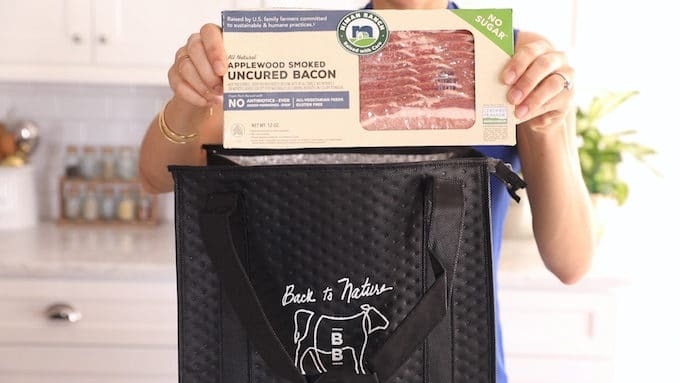 Get $20 off + FREE bacon in your first box! Yep – there’s such a thing as healthy bacon! I truly believe that in moderation, bacon can be a part of your healthy lifestyle. Butcher Box‘s bacon is uncured, sugar/nitrate/hormone free, made from pasture-raised and heritage breed pigs AND its Whole30 approved! If you’re looking for high-quality bacon, this is it. OR FOR A LIMITED TIME ONLY, April 8-30 2019–get two pounds of pasture-raised heritage breed pork breakfast sausage (simply seasoned with salt, pepper, and sage–no added sugar!) and two packs of bacon for FREE in your first box! I truly hope you found this post and unboxing helpful. 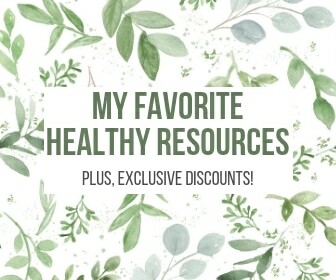 Let us know in the comments below your favorite sources for buying health animal protein! The Best Grilled Steak Marinade EVER! Thanks for the info on Butchers box! I love the idea of a butchers box and there are even local butchers around me that are setting them up. The idea of snagging local, fresh cuts of meat straight to my door is a dream. Thank you for sharing! I know that Butcher Box uses grass fed beef. Can you tell me if the grass they eat is fertilized, and if so, with what? In their FAQ on their site they say, for their beef, that US producers follow organic practices though aren’t certified organic given how expensive that process is. When organic practices are followed, that means fertilizers won’t have chemicals, pesticides, etc. I subscribed to butcher box… they have no clue … they delivered three boxes to my house over the last three weeks or so. All the boxes arrived with the meat totally thawed and spoiled. Do not use this service they have no clue. Sorry to hear about your experience J! Nothing like that has ever happened to me before and I’ve been using Butcher Box for over a year. We just had the same thing happen to us twice! We will give it one more try. To be fair, the condition our box arrived in was FedEx’s fault. Butcher’s Box has been cooperating and sending us replacement boxes. I do feel really bad about the meat that is wasted. I hope they can figure out a solution to keep this from happening to so many people in the future! I feel so out of the loop – I didn’t even know Butcher Box existed. Seems like such a great idea and time saver for busy families. Thanks for sharing this! Oh my! Where have you been? Haha jk 😉 Glad you know about it now and hopefully you get to try it out! I’ve had ButcherBox on my radar for MONTHS and now am convinced that I gotta try it! Thanks so much for putting together this insightful article. I KNOW you’re gonna love it, Sarah!